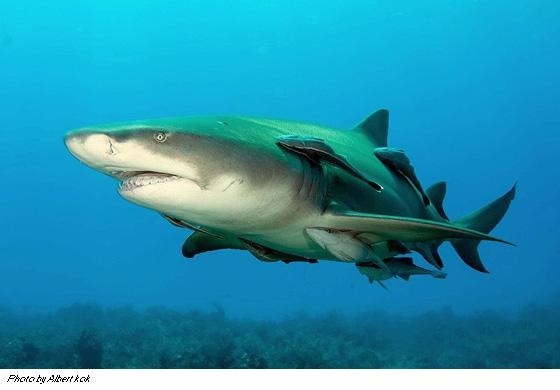 hen I tell stories about diving in Bora Bora (and it is not difficult to get me started), I use both arms and my elbows in huge chomping motions to mimic the great jaws of an eleven-foot lemon shark ripping chunks from a slashed tuna tethered to the dead coral. The Pacific blacktip reef sharks from my previous French Polynesian shark-feeding in Moorea were dwarfed in comparison. Granted, the record size logged for a lemon shark catch is twelve feet, but the average size is eight to ten feet in length, and there were another three of four of such “smaller” sharks buzzing about. Occasionally, one of those puny eight-footers struck the bait for a quick taste, but none were daring enough to compete with “Big Mama” for control of the tuna. Once she showed up, it was pretty much her private meal, and she made short work of it. As for the small handful of four-foot Pacific blacktips that approached, they warily darted in and out for scraps and then made themselves scarce. Lemon sharks eat mollusks, crustaceans, but also other sharks The dive guide later described the bigger one as a pregnant female. Since my wife and I weren’t planning to join another shark-feeding on this trip, I was certain we wouldn’t have another underwater experience that could come even close to this one. Bora Bora, however, is one of those rare places that specializes in exceeding expectations. 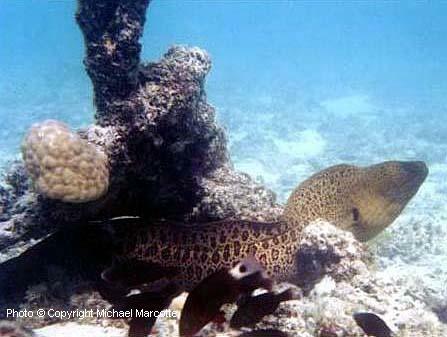 The very next day we were about midway through a dive that I had already begun to mentally note as ho-hum. We had seen a couple of Pacific blacktips swim past, and smaller schools of jacks, a few butterfly fish, Moorish Idols, and so on, but how do you compare that against a shark-feeding dive? We approached a sandy canyon-like area off Point Matira called “Aoau” where there didn’t appear to be all that much of anything, and I was ready to move on when I suddenly noticed a large blurry silhouette above and about seventy feet away. At first I thought it had to be the hull of a yacht, but then I noticed that it seemed to be moving toward us. As it got closer I realized to my great surprise it was not one, but three huge manta rays moving gracefully in a close diagonal formation straight toward us. We pretty much parked ourselves there for the next ten minutes as the three rays winged by and then benevolently turned and passed us again from the other direction. Picture the Imperial Cruiser in Star Wars slowly creeping overhead in a scene from the movie, and you might better appreciate the only somewhat lesser perspective and sense of awe that I felt as these gentle and magnificent giants swam above us. The dive guide agreed with our later consensus topside that the largest of the three mantas was approximately eighteen to twenty feet across, wing tip to wing tip. The second was slightly, but not much smaller, and the third was still another foot or so smaller. Perhaps my photo provides an idea of their magnitude, as it shows three manta rays passing at a distance of some thirty-five to forty feet away. Even with the other divers’ backs to my camera, I think you can still sense the kind of impression the mantas were making. 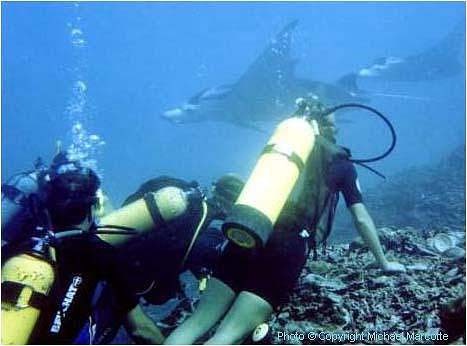 Mantas are particularly unique among the rays, not only due to their size, but also in the curiosity that this species exhibits towards humans. Not unlike dolphin and whales, mantas are known for their curiosity and unusual behavior such as intentionally approaching divers, exemplified in our case by the turnabout and gracious second inspection pass that these three provided. Those of you who have read my article “The Sharks Dining Room” will recall the obvious enchantment I had with the lush idyllic scenery of the island of Moorea and its great diving and snorkeling. Although it took me a while to journey to Bora Bora for a true surface and underwater comparison, I actually made this trip a few years ago. I had meant to write this article for some time, but somehow I became sidetracked writing and publishing a novel. 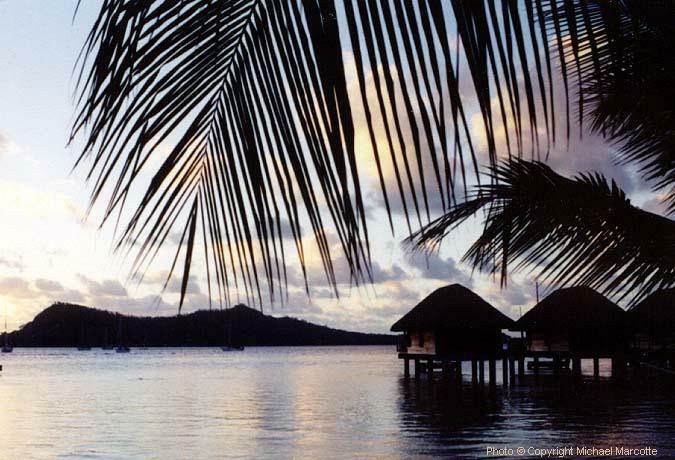 The very name Bora Bora has a nearly mythical quality. I’ve even had people express surprise upon learning that it is a real place, and indeed not a fictional one from cinema, like Bali Hai (filmed on nearby Tioman) or one from literary fiction such as Shangri-la. If you’ve ever been there, you understand why Bora Bora could so easily be confused with the geography of fictional fantasy. While Bora Bora is nearly equaled in beauty by Moorea and a few other islands in the area, one could perhaps speculate that its name derived from the Tahitian “Pora Pora” or “first born,” might be applied as first among equals. Many people believe this is arguably the most beautiful island and lagoon in the world. Bora Bora lies about 260 km northwest of the island of Tahiti in the Leeward\Society Islands of the South Pacific. Much like Moorea, Tioman and other similarly majestic French Polynesian destinations, Bora Bora rises from almost an impossibly turquoise lagoon upward to two towering extinct volcanic peaks, Mount Otemanu and Mount Pahia. The volcanic rock core of Otemanu, the higher of the two, soars approximately 2400 feet above the surrounding verdigris hillsides. Not quite 17 square miles in total size, the island support a population of only about 7500 inhabitants. Our underwater experiences here were no less rewarding. Bora Bora has given me the best dives of anywhere I have been so far. Granted, I haven’t journeyed to Fiji, Palau, the Red Sea, or a few other similarly acclaimed dive locales, but of those I have experienced up to now, Bora Bora is tops. True, the visibility and coral might not surpass the Palancar Reef system from Cozumel down along Belize to Roatan, but for the near-certainty of several truly memorable dives, the waters and aquatic life surrounding and encircled by the lagoon and encircling barrier reef are hard to surpass. There is no bad hotel choice on Bora Bora. There are seven or eight really nice resorts to chose from, all with fantastic vistas and over-the-water bungalows. I picked the Hotel Bora Bora for our stay, because it had the most history associated with it. Michener stayed there and drew from the surroundings for inspiration for his novels, and the hotel has attracted a host of other celebrities and professional athletes, although most of the other resorts could also produce an all-star list of equally rich and famous guests. When I wrote my article about Moorea, I was concerned that too many people might learn how beautiful that island is, and that it might someday be overrun by tourists. No such worries about Bora Bora. Its secret is already out. This mystical island of dreams is, however, not for everyone. At least, not on a whim. Bora Bora’s constant stream of corporate executives, Hollywood stars and other celebrities has boosted the price of a stay here to a point that you might have to save up for a while to afford a stay in this small paradise. Despite the high-brow clientele throughout the island resorts, everyone was very friendly and outgoing. The laid back, unusually quiet atmosphere puts everyone in a relaxed, pleasant state of mind. There is almost no vehicle traffic on the island or background noises besides the ocean or other sounds of nature. You can almost feel the peace and tranquility washing up in gentle waves from the beautiful lagoon. Although Bora Bora is unwavering visual entertainment all by itself, there is always a Luau that can be found somewhere nearby, or evening fire-jugglers and Polynesian dancers. There is, of course, also the famous, sand-floored bar and restaurant Bloody Mary’s that attracts, well…pretty much everyone, including the celebrities. Be prepared to wait a while to get inside. It is also one of the more economical, good places to eat. A cheesburger only cost me eighteen dollars there, and no joking whatsoever, that is a bargain on Bora Bora. Near the end of our weeklong stay, we booked a nice sunset dinner cruise aboard a sailing catamaran. 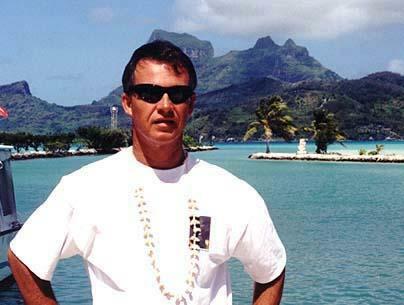 Its owner, a charming American expatriate named Richard Postma (now a well-known Bora Bora fixture himself) related over a casual, but delicious onboard dinner how he had sailed in to Bora Bora some twenty years earlier and just never left. Everyone listening just nodded or returned soft, knowing smiles. No further explanation was required.